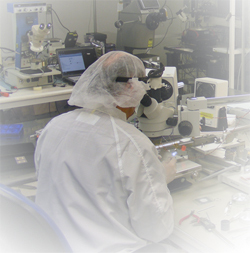 Imagerlabs was established in 2003, by a team with extensive image sensor array experience. The founders hold more than 40 patents in the field of CCD and CMOS sensor design. We have leveraged the scientific sensor experience to branch into non-imaging application with our low noise sensor arrays, such as direct ion detector arrays for mass spectroscopy and high dynamic range optical spectroscopy. Our strength in providing optimized custom sensor solutions allows our customers to meet the demanding requirements of their challenging applications. Our facility supports all the steps required for the task, including the design, a clean room for wafer probing, packaging & assembly, test stations as well as Hardware & Software support.